Beef broth with tortellini may seem very basic and, perhaps, even boring and bland but let me just say that this is no ordinary broth. It’s incredibly rich and flavorful. If broth could be described as meaty, it would be this broth. The intense flavor comes from the 14 hours of slow simmering which draws out every last drop of flavor from the beef shank and turkey wings. Because of the long cook time, it used to be that I didn’t make brodo very often. I always felt I needed to keep an eye on the simmering broth to make sure it wasn’t drying out and was staying at a steady simmer. Enter the slow-cooker. With a slow-cooker, I can throw all the ingredients in and not have to worry about it until it’s time to strain the broth. The fact that the house smells divine while the broth cooks is a nice bonus. I’m planning to make this by the bucket loads and keep a stash in the freezer to get through the winter. When I’m feeling under the weather, mugs of just the broth will heal the body and soul. You’ll notice in the recipe that the broth is not salted at all until after it is strained and re-heated. The taste will be rather flat until it’s seasoned so don’t feel disappointed if you taste the broth immediately after you’ve strained it and it tastes underwhelming. The flavor will fully develop once it’s properly seasoned. 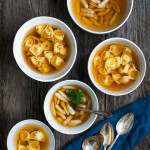 Pasta in brodo is traditionally served as part of Christmas dinner in northern Italy but don’t wait for a holiday to enjoy something this satisfying. Place beef shank, turkey wings, onions, carrots, celery, parsley, and bay leaf in the insert of a 6-quart slow cooker. Add the water then cover the slow cooker and cook on low heat for 14 hours. Remove bones and any large pieces of meat and vegetables from the cooked broth with tongs or a slotted spoon. Strain the broth through a fine mesh strainer into a large bowl. Discard the solids. Transfer the bowl to an ice bath, being careful to not let any water get into the broth, and let cool to room temperature. Then refrigerate the broth until chilled. Once chilled, remove the hardened layer of fat from the surface of the broth, and discard. To serve, reheat broth in a large saucepan over medium-high heat. Bring broth to a boil. Reduce heat to a simmer and then generously season the broth with kosher salt to taste. Add pasta and cook, stirring gently, until pasta is just tender, about 6-8 minutes. Ladle pasta and broth into serving bowls, and top with freshly grated Parmesan cheese, if desired. Different slow cookers cook at different temperatures. You want to make sure your stock stays at a low simmer during the cooking time. If your slow cooker’s low setting isn’t hot enough to keep the stock at a simmer, adjust the temperature to a higher setting. The longest time setting on my slow cooker is 12 hours. So, towards the end of the cooking time I turn off and immediately re-start my slow cooker setting the time for the remaining required cooking time. To get a really clear broth, strain it through a small strainer lined with a coffee filter. It takes longer than using a fine mesh strainer and you will need to change out the coffee filter often but the resulting broth is beautiful. I recommend using a fresh pasta rather than a dried pasta. Fresh pastas can be found in the refrigerated section at most grocery stores. Recipe adapted from The Splendid Table cookbook.